Looks like the heat is finally (FINALLY!) here to stay in Barcelona. Oh how I've missed the long summer days, drinking cold, homemade lemonade late at night, laying on the couch while seeing the lights from the small boats on the sea...and wearing summer dresses! 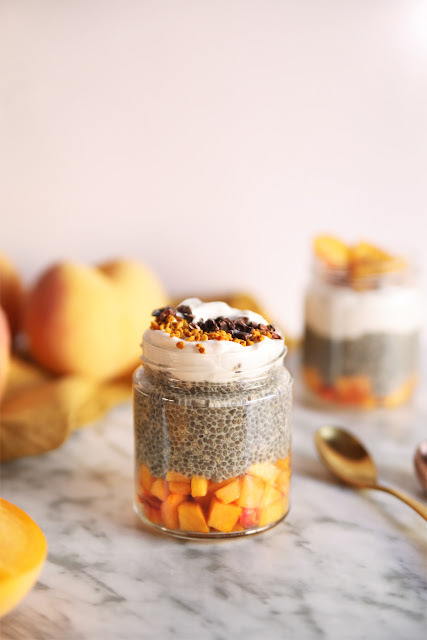 Raw desserts are perfect when you don't feel like turning on your oven because it's so hot that you already feel your home has turned into a big oven. There are lots of amazing and tasty recipes that will please everyone. I'm a newbie when it comes to raw recipes and so far I've tried some bars and small bites but I'm pretty happy with the results. 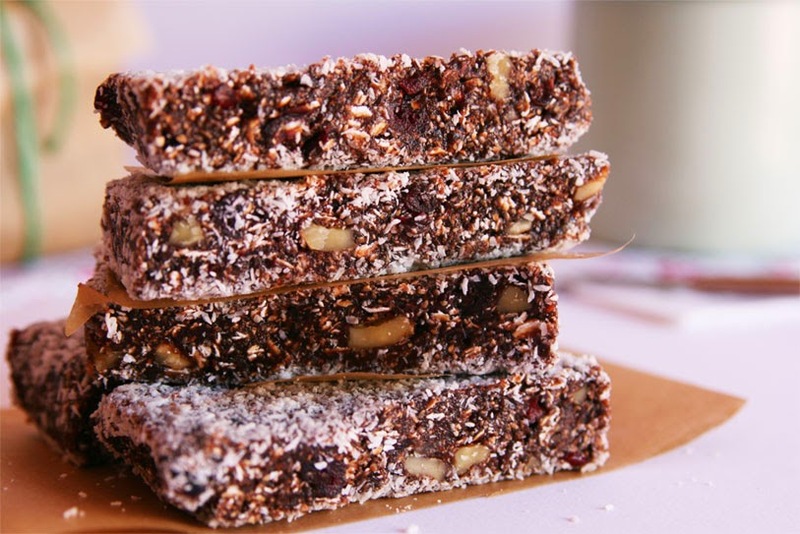 I called these bars 'No-Bake Energy Bars' because to actually make them 100% raw you'll need to use raw cacao but I couldn't find it so I used pure cocoa powder. They taste equally awesome but I don't want to get in trouble with purists raw vegans, hehe. So I'm being honest and I'm telling you that hey, maybe I was a bit rebel by using cocoa powder instead of raw cacao but sometimes being an outlaw is fun (insert mischievous laugh here). 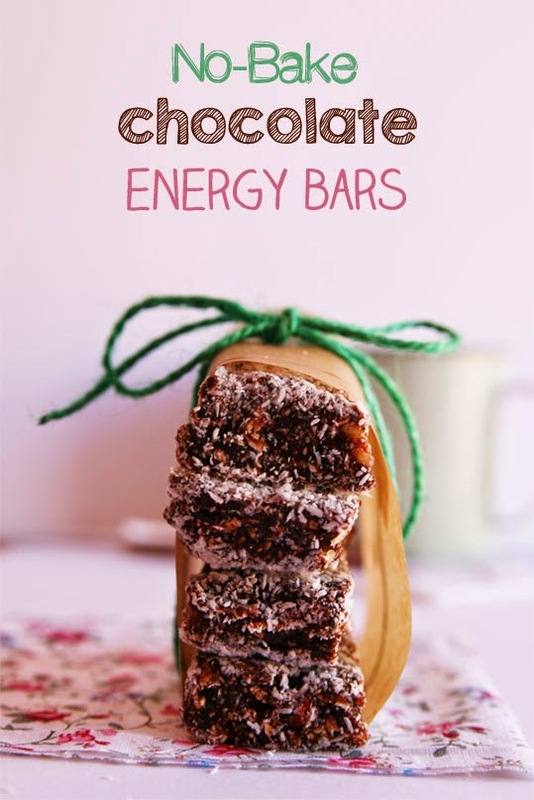 No oven was harmed during the making of these bars so we can all agree to call them No-Bake Chocolate Energy Bars. 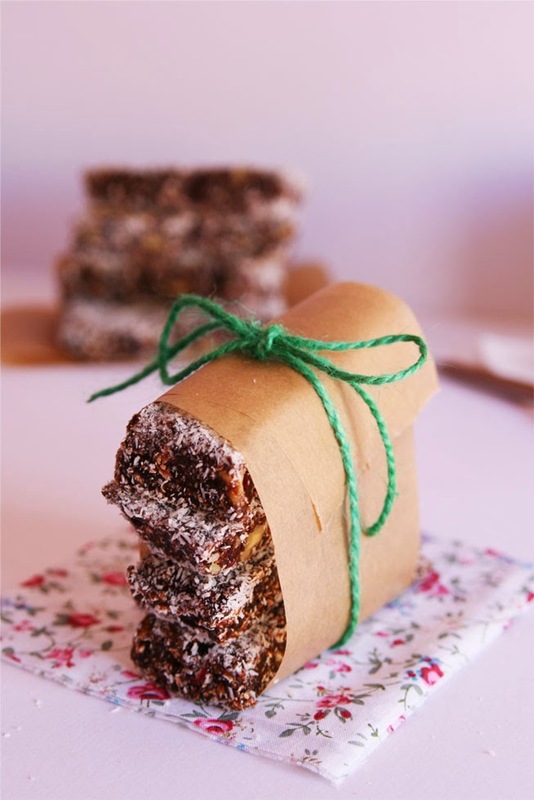 Now let me tell you how delicious, chocolatey and packed with seeds, fruits, nuts and energy they are! 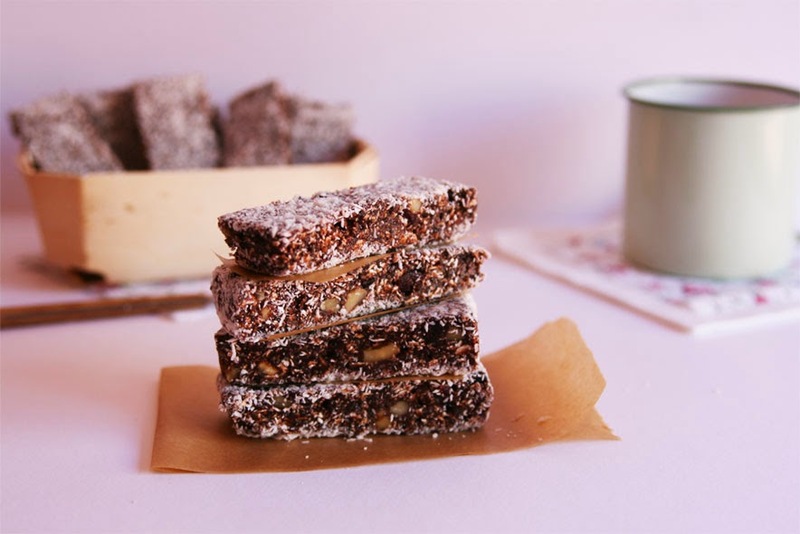 Even if you're not a fan of dates (I'm not very keen on them, to be honest) you won't notice a strong date flavor, only a great chocolate-nut taste. I love them for breakfast but they are the perfect snack before or after a workout session. Be careful cause they are so darn addictive you will want to have more than one bar...and if you're on a diet remember that dates and nut butters are pretty high in calories. Anyway, the ones I made were chunky enough to make you feel full with just one. I'm not really sure if it's easy to find almond butter where you live...I still haven't found any natural almond butter in the grocery stores here in Barcelona (apart from peanut butter) so I did a little research and made my own homemade almond butter. Even though it's quite a messy thing to do (specially if you don't have a powerful food processor like me) it's totally worth it! The flavor, the aroma...truly a delight! You'll need some patience until the almonds are so much blended they become butter. This took me up to 30 minutes. These bars don't need to be refrigerated, however, I did it. If the temperature is high (it's summer here) I recommend you to store them in the fridge so they'll firm up and won't start to get too soft once you have them in your hands. Just try it and if you see they become hard as rocks then store them in the typical cookie glass jar or an airtight container at room temperature. You can add/replace the seeds and nuts and make your own version. For example, you can add puffed quinoa to get a chewy-crisp texture or make a yummy topping with crushed almonds and maple syrup. 6 medjool dates, softened and chopped. 1/4 cup water (the soaking water from the dates). 1/4 cup pure cocoa powder. 3 tbsp maple syrup (or agave syrup). 1/2 cup chopped dried blueberries. 1/2 cup dried natural coconut. *To make the almond butter you'll need around 2 cups of almonds. Place the almonds in food processor and blend until the almonds have released their oil and you get a butter texture. You will have to process for around 20 minutes (or less, depending on how powerful is your blender/food processor). You will need to stop frequently and scrape down the sides of the food processor. Place almond butter, dates, dates water, cocoa powder, cinnamon and maple syrup in food processor and pulse together just until all ingredients are combined. Remove to a mixing bowl. Stir in rolled oats, walnuts, chia seeds, dried blueberries and salt. I recommend to use your hands to mix them cause this will get sticky and the mixing process will be quicker. 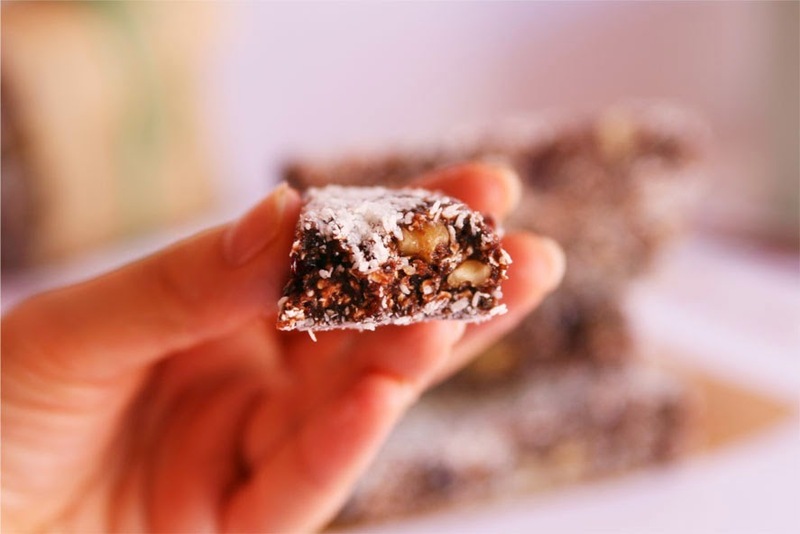 Spread around 1/4 cup of the dried coconut in an 20x20 cm baking pan (8x8 inch, the typical brownie pan). Press the mixture on top of the topping and level. 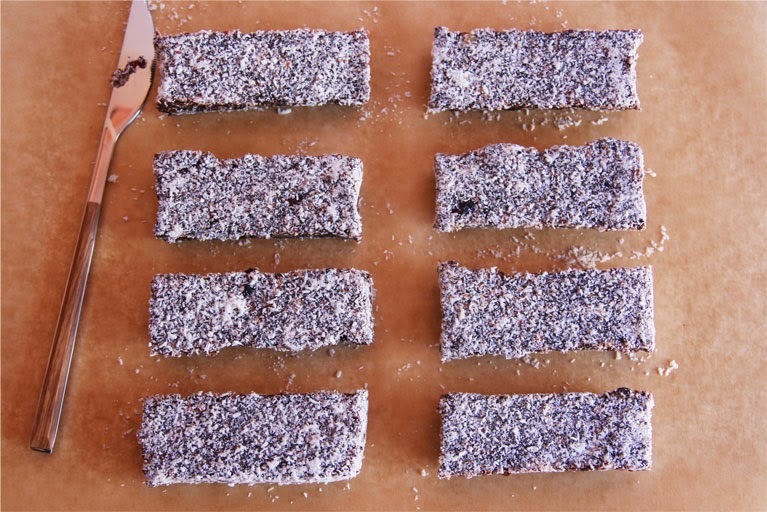 Sprinkle the rest of the dried coconut and press in with a rubber spatula to ensure the bottom and the top are covered. Remove from pan and cut into bars. If the temperature is high, store in the fridge around 30 minutes before removing and cutting the pieces.